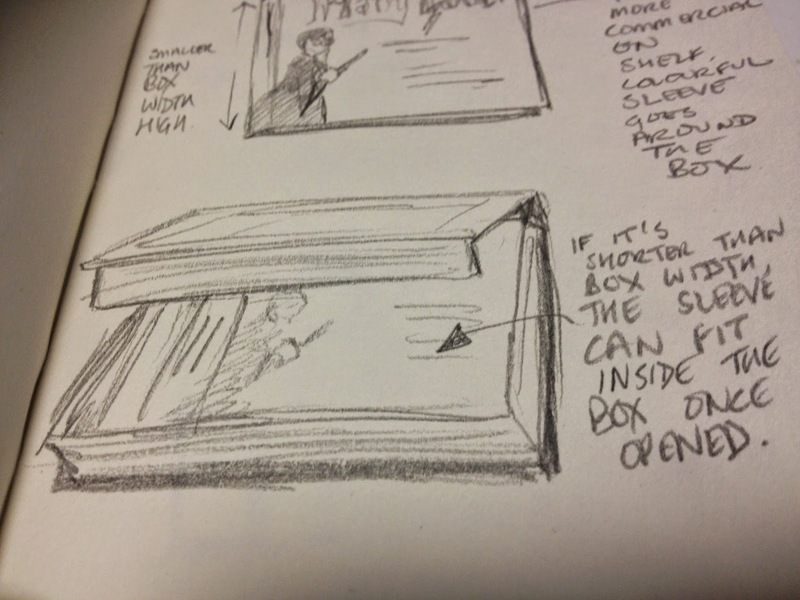 A couple of years ago I went into great detail about how, and more importantly why, a Harry Potter tabletop roleplaying game could and should exist. I direct people to the series of posts on this blog repeatedly, and (in light of new information) I thought I'd put all of the posts into one for ease of reference, update it a bit (as I've had some new ideas about how it could work) and add a new section at the end about the recent developments in Harry Potter gaming with the announcement of Portkey Games. If you've been reading the blog, or know me even remotely well, you'll know that I love Harry Potter. My love of Harry Potter has lead me to ask many times "why is there no Harry Potter roleplaying game?" My pursuit of Harry Potter as a game has seen me look into the license many, many times, and a couple of times it has seemed like it could happen - talking to Warner Bros. and everything. But alas, it was not to be. I'm still convinced that a Harry Potter RPG is a great idea, but I think it has a couple of hurdles to get over - hurdles that could be tackled by getting the right message to the right people. The first hurdle is explaining what roleplaying games are - or more importantly, what roleplaying games are now and how amazing they can be. One of the truly magical things about Harry Potter is that it got kids reading again. Not only were kids reading, they wanted to read. 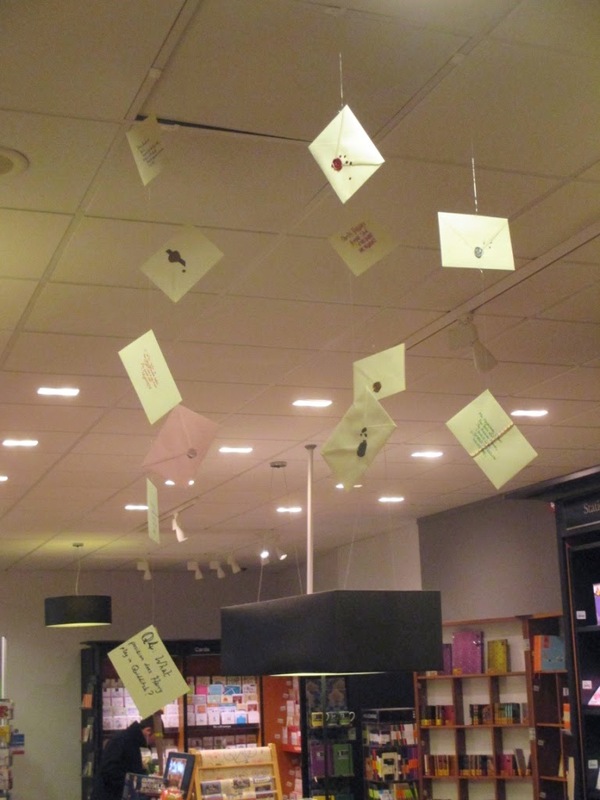 I worked in a bookstore for seven years, and the greatest and most exciting experiences there were Potter book launches - the kids in their hundreds, dressed up for the midnight launch. The first one I worked we even had owls in the shop during the day. The atmosphere on the nights was amazing. What a Harry Potter RPG could do on top of getting kids reading, is get kids using their imagination in a truly social environment. So much of our time is spent staring at screens, whether these are TVs, our phones or computers, interacting with people via texts or messages, or even strange disembodied voices from the other side of the country telling us how bad our gaming skills are. Tabletop roleplaying games have the advantage of getting people together, face to face, sitting across the table and interacting. I've mentioned elsewhere on my blog that I got my first job in the "real world" due to playing Dungeons and Dragons - the boss interviewing me had been a gamer, and knew that it meant that I could communicate, work in a team, formulate courses of action, and (handily enough as it was a cartography job) could draw maps. Dungeons and Dragons always has this social stigma associated to it - the image of grown men of generous proportions sitting in their basements. But going to a gaming convention these days, times have changed. There are far more women gamers (often more than men), and more and more kids playing. Boardgaming has become cool and popular again, and families are getting away from sitting in front of the TV and gathering around the table to play a game on a regular basis. It's a great time for games, and a great time for roleplaying gaming. The great thing about tabletop roleplaying is that it really stretches the imagination. Rather than being limited to the options of a videogame, RPGs allow your characters to do anything. You create your own stories, create characters with real depth and meaning, and work as a team together - not competing against each other - but together, creating your own stories and battling evil. The first hurdle in getting a Harry Potter RPG to be approved by J K Rowling and Warner Bros. would be to show them that roleplaying isn't what the stereotypes portray - certainly not any more. RPGs can be valuable social experiences that fuel the imagination and are perfect for kids and adults alike. The second great hurdle, and certainly one that I think is one of the tallest hurdles to overcome, is the concept of "creating your own stories", as we mentioned before. Creating such a detailed and magical world, as is the world of Harry Potter, it's understandable to be protective of it. The events of the books are set in stone, and (despite being able to wander about and do strange things in the video games) you wouldn't want people playing Harry, Ron and Hermione and changing the events of the books. However, if you set a game outside of the books, after the Battle of Hogwarts, but before the years when Harry and Ginny's children attend, that means the events of the books are held fairly sacred. But the great thing about tabletop roleplaying games is that the stories you tell in the games, the adventures you play, they are yours and stay at the table. It's not like your stories are suddenly part of the official world. They are purely your own. A great example of how this works is Star Wars. 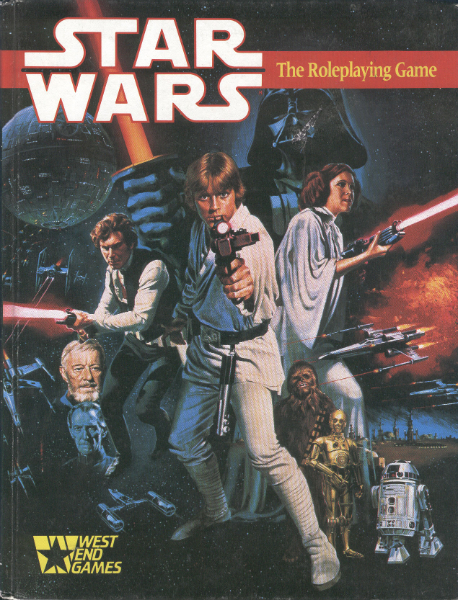 There have been multiple roleplaying games based upon Star Wars (West End Games' one is my personal favourite, but there have also been ones by Wizards of the Coast, and most recently from Fantasy Flight Games). They allow you to play characters in the Star Wars universe, scoundrels, rebels, pilots, Jedi and more, throughout the many eras of the Star Wars history... but they never changed the Star Wars movies, they didn't become "canon", and they didn't ruin anything. Adventures were published for them, and some have been incredibly successful. But they're not part of the Star Wars universe outside of sitting around your dining room table, and in your imagination. The source material is incredibly safe. For Harry Potter, other schools of witchcraft and wizardry could be created, making the events and characters at Hogwarts even safer, rather like the nameless schools that appear around the world in the PS3 video game "Book of Spells". Of course, exclusive content, and fact checking direct from J K Rowling would be the ultimate way to go. It would be similar to the Buffy the Vampire Slayer RPG from Eden Studios. When we were working on the supplements to the game we needed the full names of characters that only had first names in the series (Faith and Kendra). Eden asked Fox, and Fox asked Joss Whedon who provided the surnames for the characters (Lehane and Young, respectively), which have now become official in books and comics since. Those, I see, are the biggest hurdles. Once you get over the stigma of roleplaying, and the care required for playing in J K Rowling's world - knowing that the game would be great and positive for kids, and wouldn't harm the world of Harry Potter, it's plain to see that a Harry Potter roleplaying game would be an awesome thing. The keys to a great Harry Potter RPG would be twofold - keeping it quick, simple and easy so that the game is fast to play, quick and easy to pick up for new players, and doesn't get bogged down in rules that would slow down what Harry Potter is all about: storytelling. 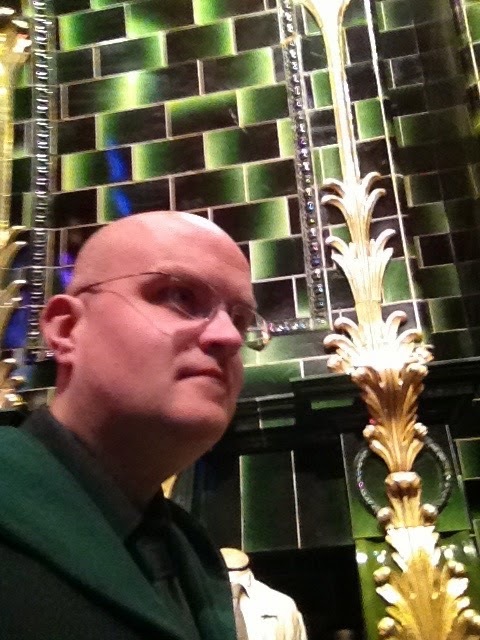 And secondly, creating a game that is true to the feel of Harry Potter's world. Over the years, as I mentioned before, I'd planned and plotted a Harry Potter RPG many times in the past. I'd even recruited my awesome graphic design friend Will Brooks to put together samples of possible designs for one of the book's layouts. The first version was trying to be busy, a little like the amazing Film Wizardry book (which, I have to confess, we own four copies of...). C'mon, seriously... if you haven't looked at that book, it's awesome. The iBook for it is just as amazing, as the images are animated, just like reading a copy of the Daily Prophet. A clearer approach was taken for a second attempt, swaying away from the movie images. Of course, pretty pictures do not give any indication of what the game would be like. I went into great detail with a potential pitch for what the main game would be like, as well as possible supplements. Harry Potter: Adventures in a World of Magic aims to allow players of all ages to experience the excitement of being a student at Hogwarts, and to enjoy the endless possible adventures that can await them in the wizarding world. Players decide upon their student’s actions as they attend class, investigate mysteries and battle dark forces. Using a quick and intuitive game system it aims to reproduce the feel of the setting, while allowing players to fuel their imaginations and develop their problem solving and social skills. The basic game will focus on their first few years at Hogwarts. Game rules are provided to allow players to invent a new student to attend the school, set after the climatic battle of Hogwarts and the defeat of Lord Voldemort. The game then takes them through the experience of shopping in Diagon Alley for supplies, choosing a wand (or rather, having a wand choose them) and embarking on the journey to Hogwarts. Rules will allow the players to be sorted into Houses, attend classes, play Quidditch, and engage in thrilling adventures while sneaking around the school. A series of introductory adventures will be included, so players will be able to start almost immediately. The basic game will be followed by periodic supplemental material expanding the information presented, and covering advanced classes, magical creatures, the Ministry of Magic, and more. Obviously, we want game players to pick up the Harry Potter: Adventures in a Magical World. All elements necessary for play will be included. The plan would be to use our own, simple and innovative system that is simple enough to be easily picked up by new players, which would be able to be used over and over again to create more complex adventures and stories. Game players who aren't necessarily Harry Potter fans will hopefully be tempted by the game's presentation and innovative game play. Harry Potter has captured the imagination of millions of fans worldwide. Most of those fans dream of being able to go to Hogwarts, to fly on a broom and cast spells with their own unique wand. This game would allow them come a little closer to the fantasy, to immerse themselves in the wizarding world and experience the magic of the books and movies. For the Harry Potter collector, we'd hope to include cool background information, possibly even exclusive content (unseen photos or design artwork, maybe even background similar to the amazing entries on Pottermore) that would entice the completist who may later be tempted to have a go at playing the game. There are a number of people who will buy the game because they collect and read this sort of thing, but do not have the opportunity or time to actually play the game. The game will include interesting information that’ll appeal to gamers and fans of the series alike, and present a handy reference in a lavishly illustrated way that would encourage readers and fans alike. Above all, the key is going to be accessibility, aiming to appeal to everyone, from 8 to 80 years old! The basic game, and all supplements, will strive to capture the feel and ideals of the books. Above all, it will be accessible, with the basic game acting as a gateway to both gaming as well as Harry Potter’s world in a clear and friendly way. Sidebars will include interesting facts about the school, creatures and staff, and the history of the wizarding world, which will appeal to Harry Potter fans. The book’s style will be visually identifiable as Harry Potter, using stills and promotional photography from the movies, and a style that fans will find familiar, presented in a similar format to The Daily Prophet, or the fantastic Page to Screen or Film Wizardry books with their amazing graphic design. It will be supplemented by quotes from the books, used to emphasise specific elements of the rules or the book's design when it adds a suitable flavour. The language will reflect the feel of Harry Potter. It will be capture the humour, the adventure and the optimism of the stories. It will also be written in “English”, using British spellings of words, rather than the traditional American spellings as seen in most games. Above all the integrity of the story will be maintained. The setting is after the events of the books, after the defeat of Voldemort at the battle of Hogwarts in 1998, but before James Sirius Potter and Albus Severus Potter attend Hogwarts. 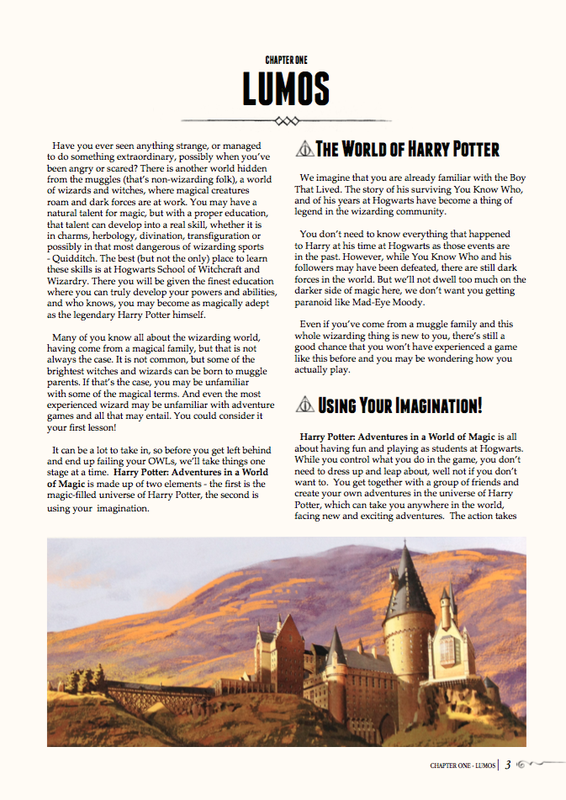 This way, while the players will be creating their own adventures and stories at Hogwarts, the events of the books, and the play Harry Potter and the Cursed Child, remain out of bounds and untouched. The game is designed to encourage children’s imaginations, storytelling, problem solving and to get them interacting in person in social situations, rather than relying on computer games and talking over the internet. And, above all, it is supposed to be fun, exciting and magical. Have you ever wanted to go to Hogwarts School of Witchcraft and Wizardry? To learn to cast magical charms, to brew potions and learn of the wizarding world? Maybe even take part in that most dangerous of wizarding sport – Quidditch? Now you can enter Harry Potter’s world, learn the secrets of Hogwarts and defend your fellow students against dark forces. Harry Potter: Adventures in a World of Magic takes you from your first trip to Diagon Alley to board the Hogwarts Express and enroll in the most prestigious and famous wizarding school in the world. All you need is a pencil and some dice! * A Student’s Book, providing a guide to creating a student to attend Hogwarts, as well as the basic rules to get you playing. 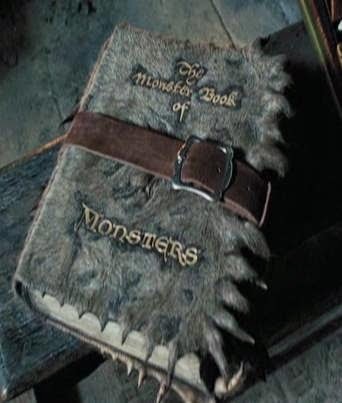 * The Headmaster’s Book, with even more options to expand the game, allowing you to do just about anything in the school from attending lessons, learning Quidditch, to sneaking around the castle to investigate rumours of strange goings on, or venturing into the Forbidden Forest. * Report Cards to keep track of your students’ progress through the school year. * The complete game rules, simple and easy to use for new players, and able to handle even the most troublesome situation. * The basic lessons of magic, how it can be used, what must never be used and where you can use it. * A smattering of magical creatures and beasts that may be encountered during the average school year. * A guide to creating your own adventures and advice for the Students and Headmaster on how to play them. All of this and more is covered! * A complete adventure, ready to play, so you can start playing straight away! game books look awesome like this? 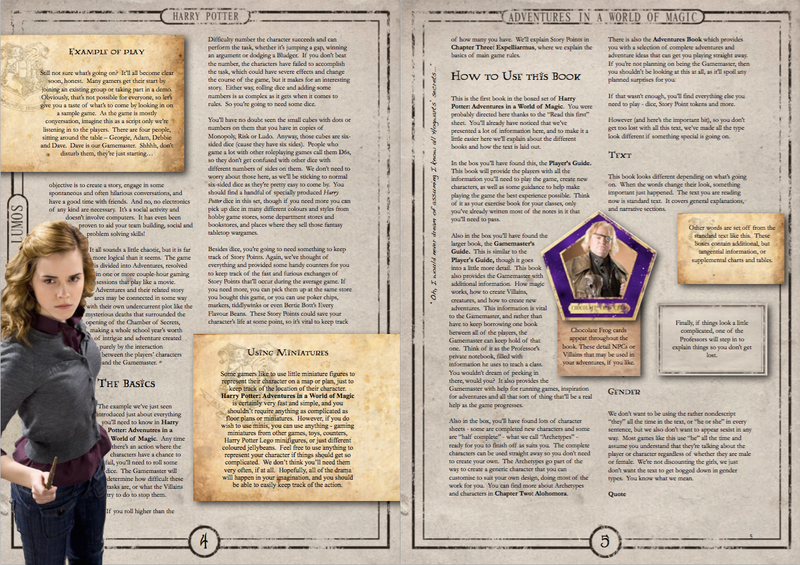 Written from the perspective of either a Hogwarts Prefect or possibly the Head of House, this book will introduce all of the rules for the player, as well as offering some advice on how to play and how to get the most out of the game. The first section will introduce readers setting the tone for the game. It will also provide a summary of what is to follow, and the conventions used (text conventions, sidebars, font indicators, rule descriptions, gender references, measurements and a note about the author(s)). A very brief summary of the world of Harry Potter is explained for those foolish enough to be unfamiliar with Harry’s adventures or the wizarding world. The basic explanation of the game and its elements are introduced here. Using an example of play, the way the game works, how the players create an adventure in their imagination, while using rules to avoid the typical “I got you,”/ “No you didn’t” problems. The basic terms of the game are also covered here. The game requires the Report Cards, Tokens to keep track of things, and dice, all of which are provided in the box. Each player controls a new student at Hogwarts, going to classes and sneaking off to have adventures and uncovering possible threats to the school. There is a Headmaster, a player who controls the action and knows where the story will develop and controls any extra characters, or enemies the players may face. The adventures are divided into Chapters, resolved in one or more gaming sessions. Chapters can be linked into a story arc that can last the whole school year, building into to an epic story created purely by the interaction of players. The bulk of the Student’s book is dedicated to filling in the player’s Report Card, which defines how good they are at doing certain things, and explains what the grading on the Report Card actually mean for playing the game. The students can come from all walks of life, and the game allows for this. Whether muggleborn or pureblood, with a knowledge of the wizarding world or coming to it all new – just about anything the player can imagine is possible. The only limitations are playing inherently evil characters or setting the game during the events of books. Those are forbidden. Harry Potter is all about good overcoming evil, how love can conquer hate. It is about players having a good time and being happy – and while there is danger, and darkness, the players are actively keeping this darkness at bay rather than embracing it. The events of the Harry Potter books are set in stone and the game is designed to avoid playing during the events of the return of Voldemort. The other large section in the student’s book covers the full game rules, everything from classes, potions, charms, flying, and all of the drama and action that we’ve come to know and love. One basic mechanic (roll two dice and add the student’s grade from their Report Card; the higher the total, the better the result is) determines the result of most actions, from noticing a clue to avoiding a Bludger. This mechanic is only used when the outcome of an action is in doubt and is dramatically important; no rolls are used for eating trifle or walking down a school corridor, unless it is somehow relevant to the Chapter. Most tabletop games are about competing against each other to find a definite winner. However, this game is all about working together. Helping each other through the school year, working as a team to uncover any dark forces that may be threatening the school, and using each other’s differing areas of expertise to win through in the end. Just as Harry, Ron and Hermione were challenged to use their own skills (flying, chess and herbology knowledge) to get through the tests that lead them to Professor Quirrell at the end of Harry Potter and the Philosopher’s Stone, the players will find that cooperation will overcome almost any obstacle. Actual direct conflict with other people or creatures remains true to the themes of the book. The spells immobilise, disarm or hinder, and never kill. The Unforgivable Curses remain off-limits to the students, and even experienced players who feel they have to use such a Curse will find their student wracked with guilt and nightmares. This doesn’t mean that characters cannot be killed during the game – Hogwarts can be a dangerous place at times, but in these times of peace such an event is rare. House Points allow players to temporarily nudge reality in their favour. If a roll doesn’t go their way, or if they are badly injured, or unable to fathom a way out of the situation they’ve wound up in, House Points can be spent to tweak the game at suitably dramatic moments to the player’s benefit. House Points are gained by good game playing, making witty lines at apt moments, being brave and making the story dramatic and exciting. At the end of the school year, the House Points that the students have earned can go towards the House’s totals, in order to win the House Cup. The rules section also cover the student’s actual learning – whether this is during classes and being studious, or through their experiences outside of the classroom. The students mature, get better at their work and grow, and as such, their grades may improve. Of course, if they spend all of their time on the Quidditch pitch or being a socialite their studies may suffer and their grades may actually go down! Finally, in the student’s book, are a few helpful guides for playing the game and getting the most out of it. The Headmaster’s Book repeats most of the information from the student’s book, allowing the Headmaster to have access to the game rules without having to repeatedly borrow the book from the other players. 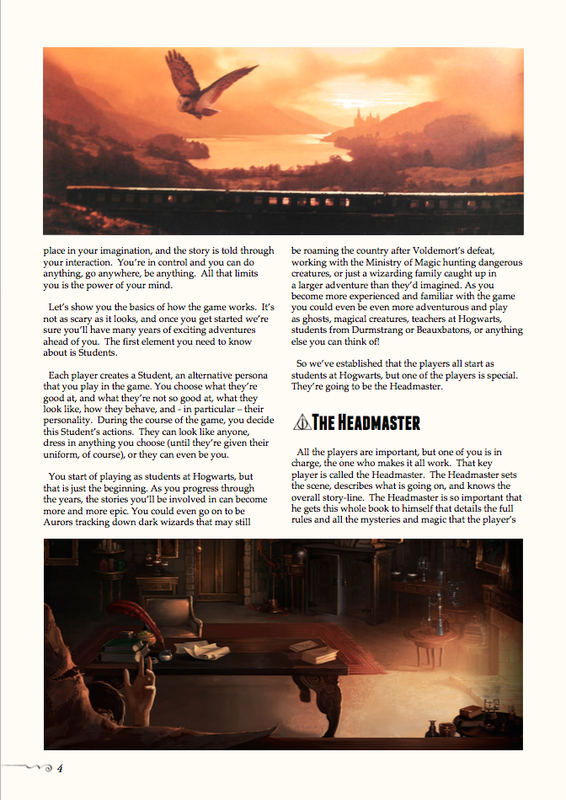 However, the Headmaster’s book also includes additional information, clarification of the rules, and additional advice on how to play the game. Written as a guidebook supplied to a new school headmaster, the book features additional rules for writing up a student’s Report Card, playing through their first trip to Diagon Alley, purchasing their wand (or rather, having a wand choose them), through to the train journey to Hogwarts. 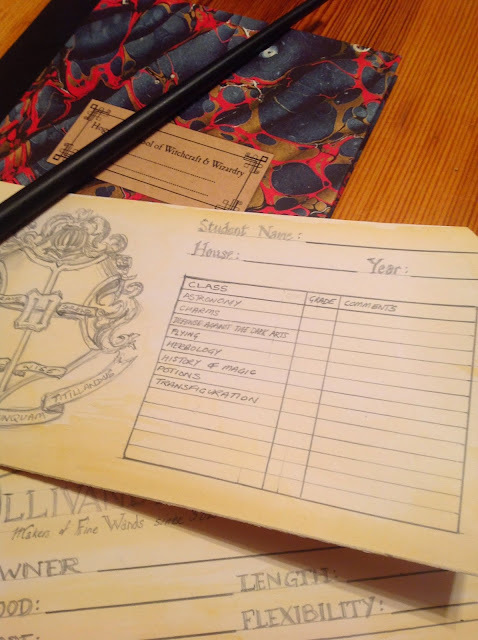 It also details the important process of being sorted into a House, as well as advice for playing a game where the students are all in different Houses. Of course, each House is covered in more detail to give the Headmaster more information for running the game. 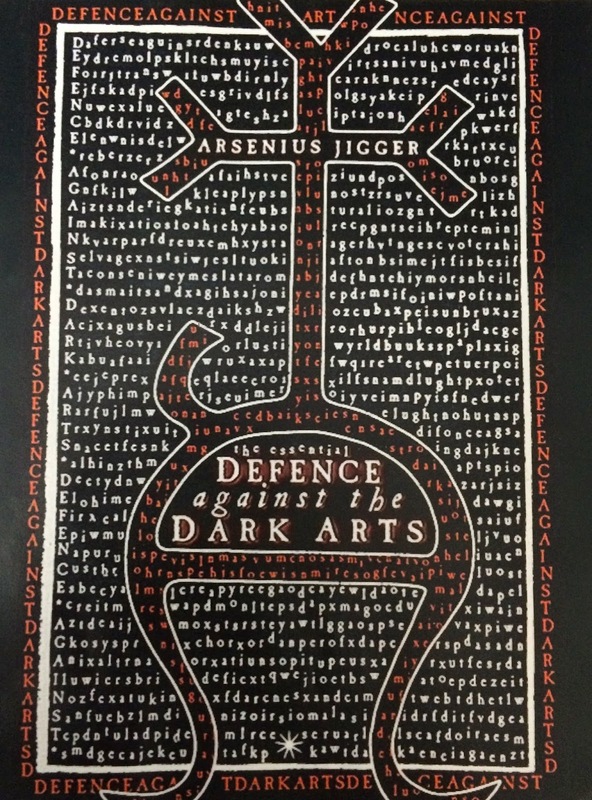 The Headmaster’s Book also goes into more detail with the basic classes as the students learn about Astrology, Herbology, Charms, Potions, flying and the all important Defence Against the Dark Arts. The limitations of magic and the Principal Exceptions to Gamp’s Law of Elemental Transfiguration are also covered, so that the Headmaster knows exactly what the students can and cannot do with magic. A section of the book also covers playing Quidditch, allowing students to take part in the most exciting and dangerous of sports. The rules are quick and cinematic, allowing the actual game of Quidditch to feel fast and action packed, like watching it in the movies. An additional game will be produced to allow a more strategic Quidditch simulation at a later date for those who wish to incorporate it into their school year. A brief overview of the school, locations and classrooms, House common rooms, and notable events is covered for the Headmaster to refer to during the game. The surroundings are also covered briefly, including the Black Lake, The Forbidden Forest, the Gamekeeper’s Hut and Hogsmeade. While Voldemort has been defeated, there is still danger and threats to the students as well as the school itself. Woe betide anyone who feels they’re able to wander through the Forbidden Forest without thinking twice, and who knows what may be lurking in the castle’s dungeons? Most of the Death Eaters have gone into hiding or have been rounded up and sent to Azkaban, but there may be one or two plotting in the shadows, looking to gain a fraction of the power that they once had. This section details some of the creatures, Villains and threats that the students could encounter on a particularly bad day at school. Finally, the book also gives the Headmaster everything needed to create and run a game. Advice and guidelines for the development of Chapters and Terms is also provided, as well as help in creating the overall themes of the story. The themes of the books – potential, optimism, love conquering darkness, and destiny are all suggested here, and the Headmaster is encouraged to keep the game in the same tone and share these themes. Acting as Headmaster can be a little daunting, and this section aids the player who has never managed a game before. Advice includes avoiding “railroading” the players on a predetermined plot, concentrating too much on classes and ignoring the personal dramas that make the story interesting, and getting a feel for how the game is going to ensure everyone has fun. An Appendix is also included to recommend further reading, provide a glossary of terms and spells, and handy game-play reference. look like one huge book. 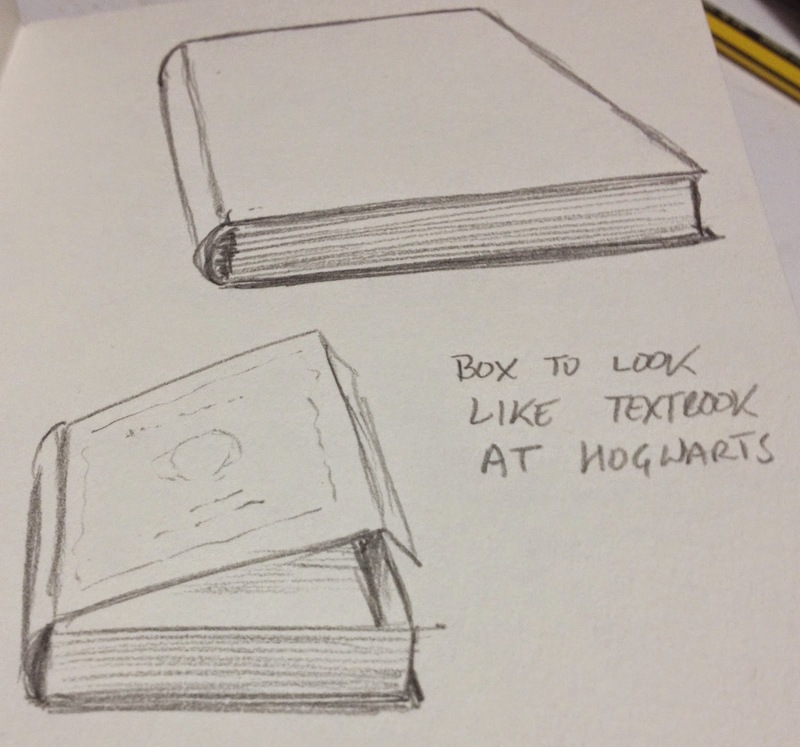 The idea would be to have a basic game that would come in a box, designed to look from the outside like one of the old textbooks from the Hogwarts Library. 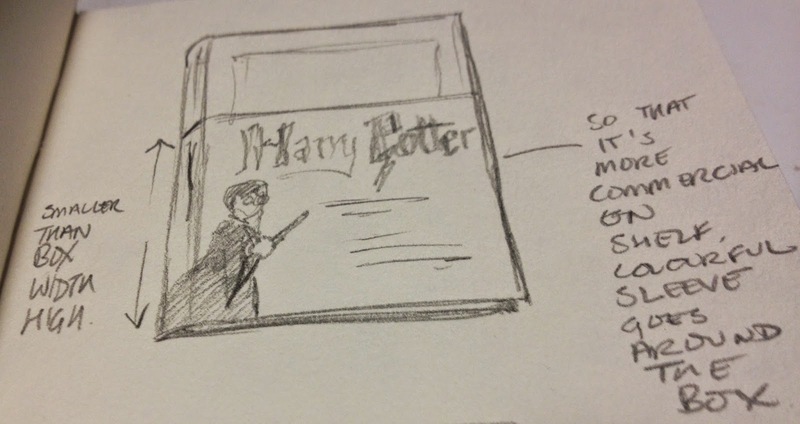 To make the box more attractive and more commercial, this would be wrapped in a slip-cover that would partially cover the front with more colourful images of Hogwarts, Harry and so on, and provide information about what is inside. This cover would be slightly shorter than the box is wide, so the cover can be stored inside the box once opened. Not only that, the inside of this cover would be filled with useful information for the Gamemaster so the cover could double as the Gamemaster's Screen. So that was the initial pitch. This doesn't include the plans for the supplements, the expanded rules for the later years, and more. Now, I thought I'd look at the actual game system and how it could work to replicate the feel of Harry Potter and the wizarding world. When the pitch documents were first put together, the basic idea was to use the Vortex system I'd created for Doctor Who: Adventures in Time and Space for Cubicle 7 Entertainment. It seemed the easy thing to do, adapting the gadget rules to work for magic items, and so on. But the more I thought about it, the more I reconsidered. Sure, the basic mechanic could remain, but it didn't necessarily need to. Working on my pet project, WILD, the RPG of dreamshare, creating a system for that naturally fired off some new ideas of how a game system would work for Harry Potter. Most roleplaying games (Doctor Who included) use a basic Attribute and Skill mechanic. Add the two together, or one modifies the other, and bingo. Harry Potter would be similar, except the Attributes and Skills would be a little more broader ranging and less restrictive. Everybody can do everything, its just that some people are better at some things than others. Neville is brilliant at Herbology, and Hermione lacks the talent for Divination. But they can all do it. Brave, Cunning, Dedicated and Wise. It's rare that something happens in the world of Harry Potter that wouldn't fit into one of those four. You'll notice that those four descriptors seem a little familiar. That's because those are the key words usually associated with the four houses of Hogwarts - Gryffindor, Slytherin, Hufflepuff and Ravenclaw respectively. Students would have one of these "attributes" at 5, one at 4, another at 3 and one at 2. The high Attribute would determine the House the student it sorted into. Highest Attribute is Wise? Ravenclaw! Have your 5 in Cunning? Slytherin! But what about strength, or dexterity I hear you ask. Well, that's where the "skills" come into it. Instead of a long list of Skills like athletics, firearms, dodge and so on, it makes more sense to simply break it down into the classes that the students attend in Hogwarts. Flying is mandatory for first years, and the remaining classes (Astronomy, Charms, Defense Against the Dark Arts, Herbology, History of Magic, Potions and Transfiguration) covers just about everything needed in the game. Hence the Dumbledore quote above. Once the students reach their third year, they opt to choose another two classes out of Arithmancy, Care of Magical Creatures, Divination, Muggle Studies and Study of Ancient Runes, just like in the school. Then, simply, you'd roll a couple of dice, add the suitable Attribute and the correct Class, and try to beat the difficulty of the task, just like Doctor Who. But thinking of the Doctor Who system, the results of the rolls used to be split into three levels of success, and three levels of failure, using the very cool Yes, But, No, And style of gaming. You know what else has three levels of success and failure? Ordinary Wizarding Levels - the wizarding world exams. It's like it was meant to be! How the Success Table would work just like O.W.L. results! Quidditch Pitch would be for flying, or any athletics and physical activity. Divination Class would not only cover prophecies and divination, but also perception. These broad definitions could be paired with report comments like "exceeds at the Patronus Charm", or "often suffers from explosive side-effects", which could give bonuses and penalties, like the Good or Bad Traits in Doctor Who. With character sheets that look like report cards, wand sheets with information of the wand's qualities on mock Ollivanders receipts, the other options are endless... Broom sheets as receipts from Broomstix, or Quality Quidditch Supplies... and familiar sheets with stats for owls, toads or cats from Eeylops Owl Emporium or the Magical Menagerie on Diagon Alley. You could take the props route even further with a couple of other options for task resolution. For a simpler task resolution system, you only need to look to Cubicle 7's Lone Wolf RPG for inspiration. In a genius move, rather than using dice, you flip a counter into the lid of the box and it lands on a grid of numbers which gives you a result. Simple! Brilliant. What does that sound a little like? Using a printed counter that looks like a gobstone, you could flip them into the lid of the box onto a grid (that could look a lot like a gobstone playing field) to replace dice rolling. You could even have places on the grid that would be when the stone spits at you, indicating a disastrous result! I could go into more detail about how Quidditch would work, wizard duelling, and more, but this is already a lot to take in. As you can tell, the Harry Potter RPG is constantly on my mind, suggesting new and exciting ways of running the game, talking to me like a Horcrux in the night. "The mind is not a book to be opened at will and examined at leisure." Next, I thought I'd take a quick look at potential supplements for the line, and how it would take the game beyond Hogwarts and into the world of magic. Beedle the Bard, and other Harry Potter reference books! 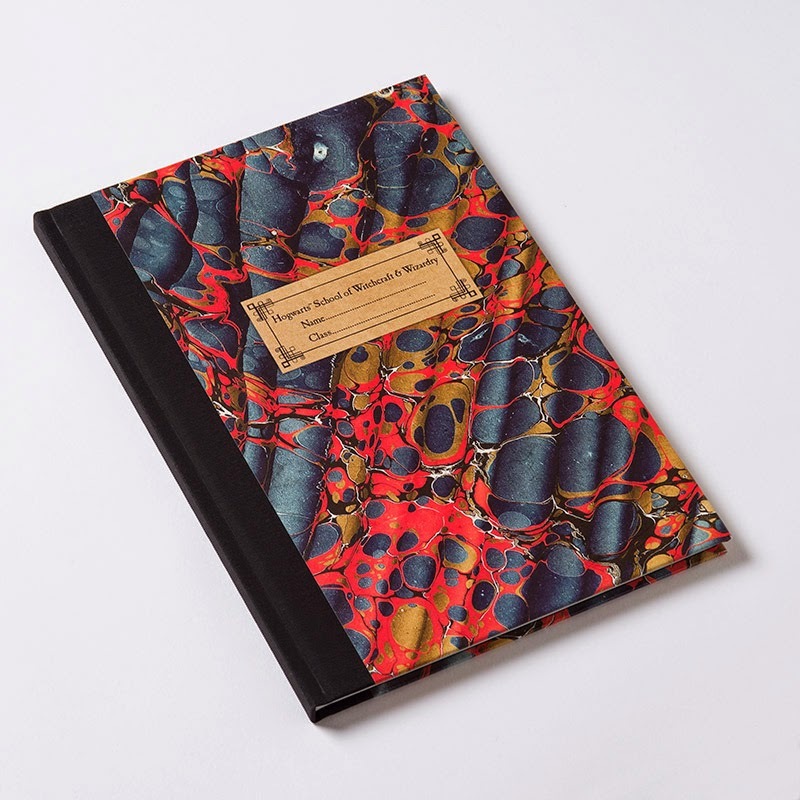 Each supplement would be presented as a book that could actually exist in the wizarding world, complete with cover design and layout that would fit right in on a shelf in Hogwarts. 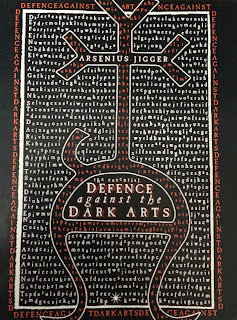 Presented as a guide for selecting the optional courses, this book expands upon the rules of the game and allows students to choose their options in the Third Year (adding two of the following courses – Arithmancy, Care of Magical Creatures, Divination, Muggle Studies and Study of Ancient Runes) as well as the more advanced versions of their usual classes. The book also presents some of the really advanced magical techniques that are taught to the older students, and prepares them for their OWLs and NEWTs. Apparation and other more exclusive classes are covered for use if there is enough demand for the staff to warrant running the classes (for Sixth and Seventh Year students). 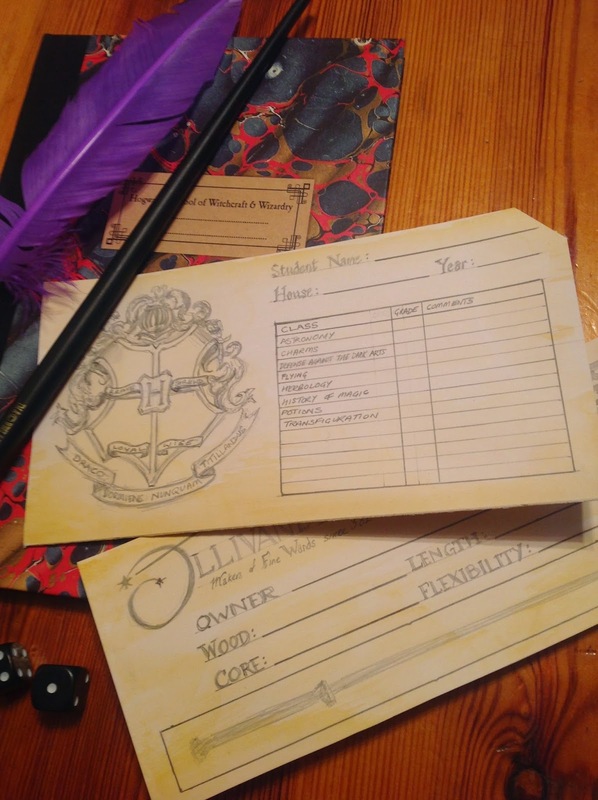 The rules also aid the Headmaster in creating more and more challenging adventures for older students at Hogwarts, taking the game to vast and epic proportions! Some students may wish to seek a career at the Ministry of Magic once their education at Hogwarts is complete. The Ministry offers many opportunities to the wizarding graduate and this set of additional rules allow players to continue to game while working for the Ministry. The various departments are covered, most notably the exciting Department of Magical Law Enforcement, and the legendary Auror Office, as well as the Improper Use of Magic Office, Magical Law Enforcement Squad, the Misuse of Muggle Artefacts Office, and the Detection and Confiscation of Counterfeit Defensive Spells and Protective Objects Office. Of course, if they don’t fancy a career there, there are plenty of other options available including the various offices in the Department of Magical Accidents and Catastrophes, the Department of International Magical Cooperation, the Department of Magical Games and Sports, the Department of Magical Transportation, the Department for the Regulation and Control of Magical Creatures, and the ever secretive Department of Mysteries. The Wizengamot will not be an option for the players. The Ministry of Magic opens up a new world of gameplay for the players, taking on the various tasks of Ministry officials, investigating strange goings on and the misuse of magic in the wizarding world. It also doubles as an essential resource as a location for visiting Hogwarts students. It’s all well and good being in charge of things, but it can be a bit tricky sometimes trying to juggle all of the staff, the pupils and the classes, and that’s before any of those unforeseen catastrophes happen. This book provides advice and additional game rules for the Headmaster to help them with running the game, planning new adventures and what to do if the players decide to go off in unexpected directions. 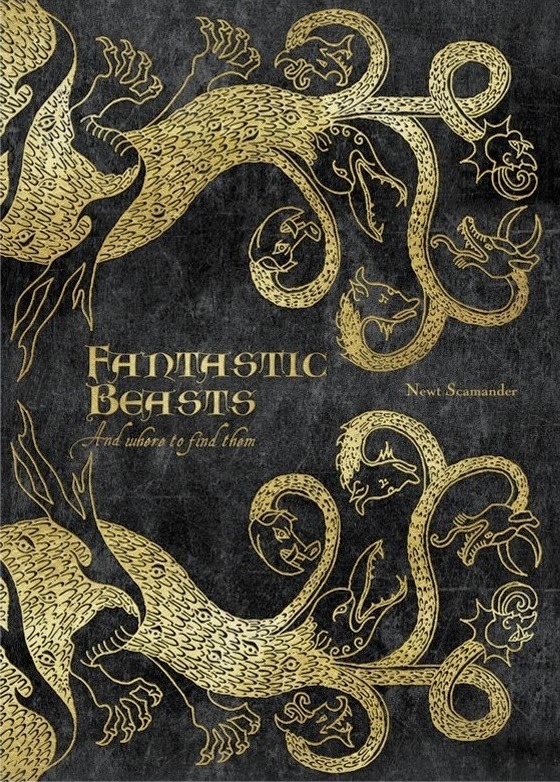 While the Basic Game provides a smattering of monsters and bizarre creatures that may be encountered during the average school year – whether this is during class or through reckless venturing into the Forbidden Forest – it only begins to scratch the surface of the vast menagerie of wild and wonderful creatures that inhabit the wizarding world. Cataloguing some of the most interesting, rare and exciting creatures to be encountered, this is a handy resource for anyone wishing to explore or hoping for a career in the Ministry of Magic’s Department for the Regulation and Control of Magical Creatures. Expanding upon the Monster Book of Monsters, this adds even more information about magical creatures through history, and expands the game into the era of Newt Scamander and the new pentology of movies set within the wizarding world. This adds new, post school career options for magical explorers and opens up the world to budding Gilderoy Lockharts everywhere. Hogwarts is well known to be one of the most prestigious places to gain a magical education. Certainly, after the defeat of Voldemort, it has become one of the most famous wizarding schools of its kind. But it is most definitely not the only one. While some choose to home school their young wizards and witches, other schools are out there in case Hogwarts is considered potentially too dangerous. Of course, these other schools are the institutions of choice for those in the country where they are located, but sometimes exchanges and such events as the Tri-Wizard Tournament mean that interaction with other schools becomes part of the academic year. 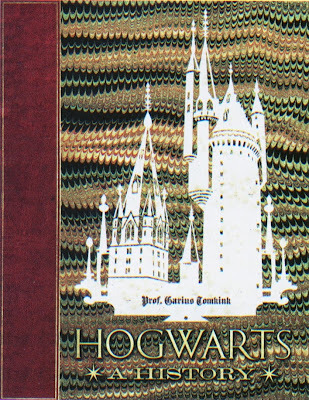 This book gives the Headmaster additional information and rules for setting their game at Durmstrang or Beauxbatons, Ilvermorny or Mahoutokoro, or even a whole new school of their choosing, or for incorporating students from other schools as part of an exchange program or tournament at Hogwarts. One of the most dangerous lessons in the academic year, this deserves an additional textbook of its own. 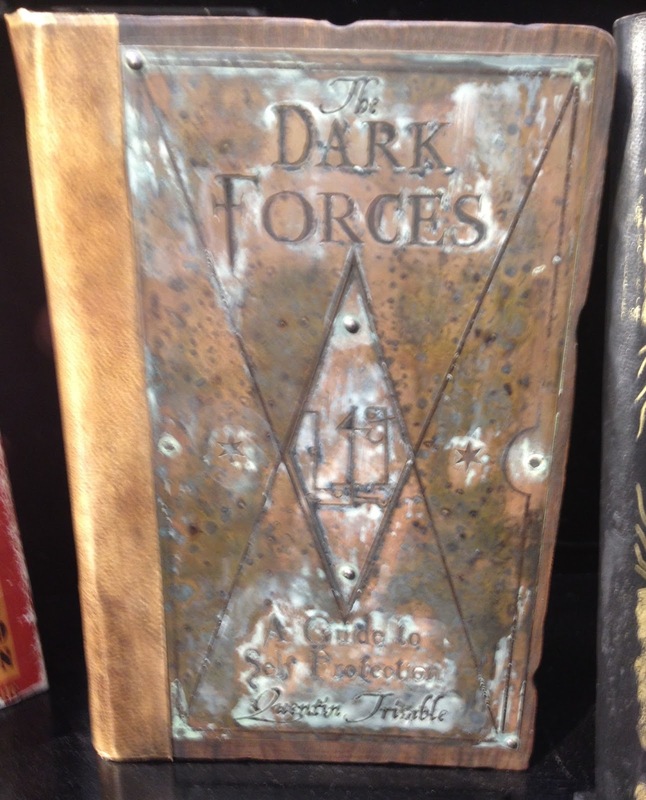 Not only does this provide information for the Headmaster about the dark magic out there in the wizarding world, but also provides details for a host of Villains and evildoers that the students may have to face as part of their adventures. However, the most essential information within this tome is advice for the student on how to defend themselves against such evil and how to counter any of their dastardly plots. cover by MinaLima for the movies. Hogwarts is a huge place with a colourful and eventful history. This essential handbook for the budding Hogwarts Headmaster collects all of the necessary background information about the school, the various locations within the walls and in its surroundings – from the astronomy tower to the dungeons, from the Headmaster’s office to the Chamber of Secrets, right out to the Owlery and the Quidditch Pitch, to the Dark Lake, the Forbidden Forrest and Hogsmeade. And that's it. 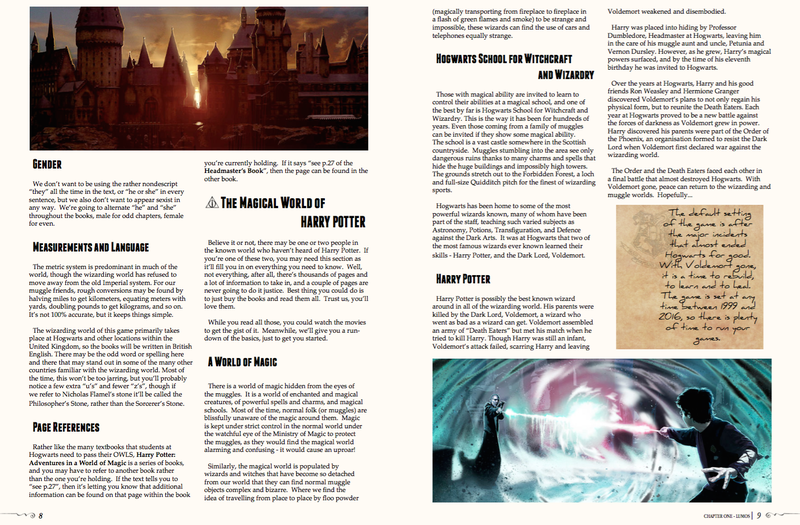 That's everything that has been compiled to date in my head for a potential Harry Potter roleplaying game. 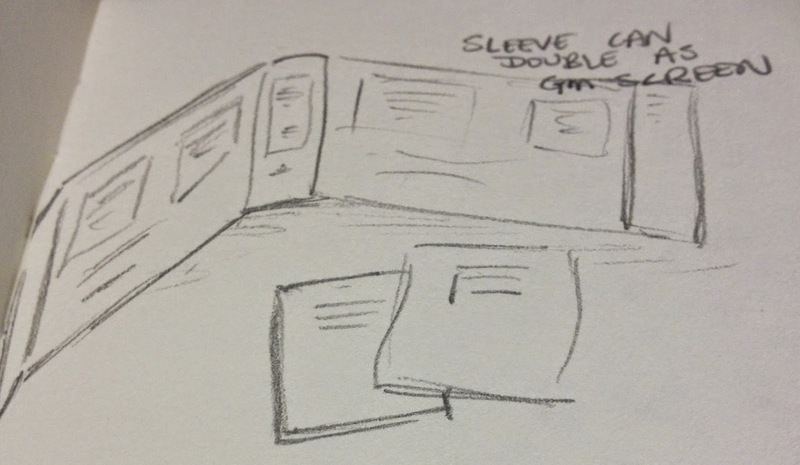 Ideas are always popping into mind, but I'll leave these blogposts as it. It would be amazing if this line were to be made, but for now they will remain as fantastic books in my overactive imagination. Maybe one day, execs from Warner Bros. or the legendary J K Rowling herself will see these posts, see what a great game it could be, how it would be respectful to Harry's world and Rowling's amazing creation, and how it could spark the imagination of kids and adults alike. I originally wrote most of the above posts a couple of years ago, shortly after we'd started talking to Warner Bros. about the possibility of doing a game, and only getting so far (it wasn't something they were considering at the time). Since then, the thoughts of a Harry Potter RPG have always been lingering in my mind. However, recently (and hence the new post) there was the announcement on Pottermore that Warner Bros. Interactive had launched a new gaming division called Portkey Games. A new division whose only purpose is to develop mobile and console games in the Wizarding World. "...have been inspired by the Wizarding World." I say, this is sounding like something I was pitching earlier! "...not direct adaptations of the books and films..."
"...interesting new locations, characters, story elements, etc." "...experiences place the player at the center of their own adventure." OOooooh, now we're talking. So under license from J K Rowling, Portkey Games will be making new stories, in new locations, with new characters, that may interact with familiar locations and characters from the books/films, won't be considered canon, and are all about the players being the focus of the action. This is JUST what I was talking about earlier! Hopefully, if Warner Bros. are happy with this to happen in video games (which have a far greater audience and reach) then maybe we can hope to see a tabletop Harry Potter roleplaying game in the future. I just hope I'm the one to write it.